Bodhicitta Sangha | Heart of Enlightenment Institute is a non-profit organization offering Tibetan Buddhist meditation classes and retreats taught by Khenpo Sherab Sangpo, a professor of Tibetan Buddhism in the Nyingma lineage. Teachings by Khenpo Sherab Sangpo are open to all who wish to awaken bodhicitta via teachings and meditation practices that generate compassion and loving-kindness for all living beings. To practice the good heart of love and compassion, there is no need to become a Buddhist. Whoever we are, we need a sincere, non-deceitful, kind heart. If we have it, we will definitely have a happy life and we can powerfully benefit others. The focus of my teachings is to guide my students in developing their bodhicitta, a kind heart filled with love and compassion for all living beings. PRACTICE RESOURCES for students beginning to learn about meditation and cultivating love and compassion. PRACTICE RESOURCES for students who are preparing to enter the Buddhist path by taking refuge vows. PRACTICE RESOURCES for students who are completing the preliminary practices (ngöndro). 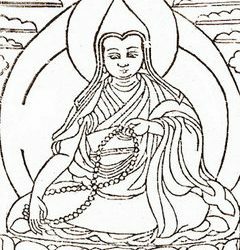 PRACTICE RESOURCES for students who are on the path of the Vajrayana and Great Perfection (Dzogchen). Enjoy teachings, meditation, yoga, and quiet time at a retreat center on a wooded lake. is located approximately 80 minutes from Minneapolis on a pristine lake with opportunities for meditation, yoga, canoeing, swimming, using the wood-fired sauna, and walking trails through the center’s beautiful woods and prairies. Click here to learn more about the retreat and to register online. Khenpo Sherab Sangpo will teach meditation instructions on the union of one-pointed concentration of the mind (śamatha) and perfect discernment (vipaśyanā). These methods help us to achieve calm abiding, a state of quieting the conceptual mind, and insight that clearly sees the nature of the mind (rigpa). Please join us for this precious opportunity to receive these essential instructions from Khenpo Sherab Sangpo’s lineage for stabilizing the mind to recognize its buddha nature. Open to all who wish to practice meditation and to cultivate bodhicitta to benefit all living beings. 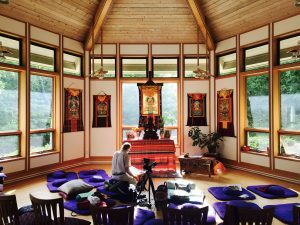 Our meditation retreats and classes are open to meditators of all levels regardless of whether you are a Buddhist or not. Join us as we listen, meditate, and grow in the Dharma together. Khenpo Sherab Sangpo will be on retreat in Asia from June 2019 until January 2020. Khenpo Sherab Sangpo will resume teaching at Clouds in Water Zen Center with a meditation retreat from 9:00 AM to 4:00 PM on Saturday, January 18, 2020. This class is open to all levels of meditators and is taught by Khenpo Sherab Sangpo. Our last class in this series will be held from 2:00 to 4:00 PM on Saturday, May 18, 2019. Please arrive by 1:45 PM and take your seat by 2:00 PM in the shrine room. Topic: Khenpo Sherab Sangpo, a professor of Tibetan Buddhism in the Nyingma Lineage, offers teachings on how to relax and rest in the nature of mind. This ultimate wisdom, our buddha nature, is innate and natural to everyone, but temporarily covered by delusion and confusion. If we break through confusion, we can relax our mind, and with wisdom, we can solve all of our problems. To do this, we need discipline (the method), meditation (the path), and wisdom (the goal). Parking: Free parking in Clouds in Water’s parking lot or on-street parking on North Farrington Street or Aurora Street. Public Transportation: Clouds in Water Zen Center is located three blocks from the Green Line: Western Station. Suggested Donation: $15, payable via cash or check at the door; or online via PayPal. We will celebrate a tsok feast at Clouds in Water Zen Center from 11:30 AM to 2:00 PM on Saturday, June 1, 2019. We will practice the ritual feast text from Mipham Rinpoché called The Rain of Blessings and The Glorious Perfect Vase: A Guru Yoga and Tsok Offering (PDF). Please register for the tsok feast so that we know how many copies of the feast text to print and how much food to prepare for our guests. Your donation will be used to buy the offerings and food needed for our tsok feast. Food will be prepared for all guests. Thank you for your generosity! The next class in the 37 Stages of Instructions class series is open only to students from Group One. It will be held on Saturday, June 8, 2019, from 10:00 AM to 12:00 PM. No drop-ins to this class series. These students have committed to a five-year practice schedule as a group. Thank you for your understanding. We meet from 7:00 to 9:00 PM to practice and read biographies of teachers from our lineage together. We use Skype for remote students. Get your account and connect with Colleen Hartwell on Skype by searching for colleen.hartwell. Call Colleen at (520) 404-848, if you have any issues connecting remotely, or Kelly O'Neil at (952) 201-1053, if you have general questions about the study group. 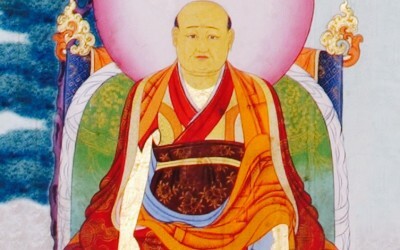 Khenpo Sherab Sangpo, a professor of Tibetan Buddhism in the Nyingma Lineage (bodhicittasangha.org), offers essential teachings on Patrül Rinpoché’s criteria for benefitting beings in this series of four retreat videos. Khenpo Sherab Sangpo, a professor of Tibetan Buddhism in the Nyingma Lineage, offers teachings on mind training (lojong) from the Kadampa master, Geshe Langri Thangpa (1054-1123), via the profound text, Eight Verses for Training the Mind. Khenpo Sherab Sangpo, a professor of Tibetan Buddhism in the Nyingma Lineage (bodhicittasangha.org), offers teachings on how to relax our mind and to recognize its innermost nature through teachings on three types of meditation: 1) renunciation mind to lessen our clinging to permanence (permanent self or phenomena); 2) bodhicitta mind to lessen our selfishness and to increase our great love for all beings; and 3) dzogchen mind to recognize the true nature of mind by cutting the root of our ignorance. 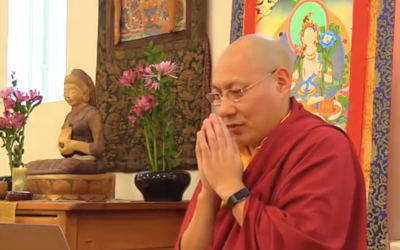 If you enjoy learning about meditation and Tibetan Buddhism via Khenpo Sherab Sangpo’s online teachings, please make a donation to support us. We are a 100% volunteer-staffed, non-profit organization that relies on our donors to make Khenpo’s teachings possible. Thank you for your generosity and kindness! 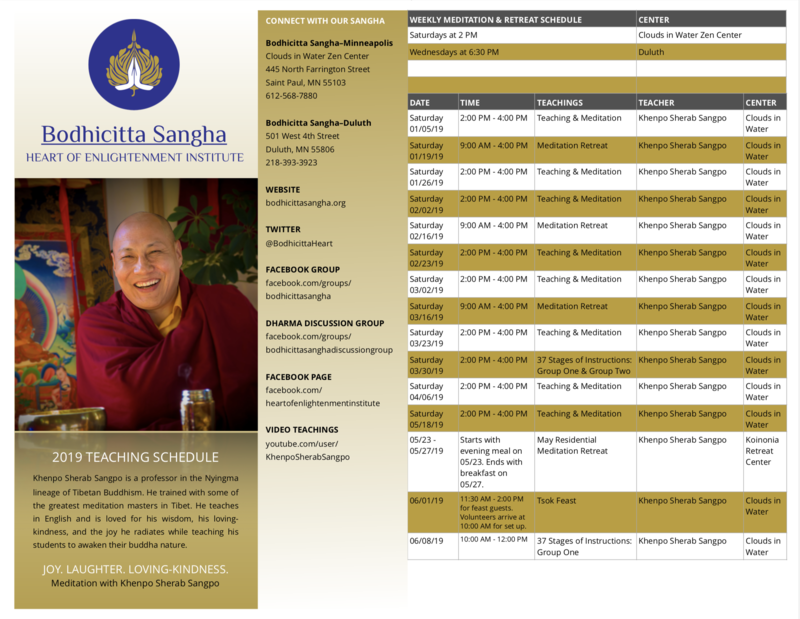 Subscribe to our monthly newsletter to receive video teachings from Khenpo Sherab Sangpo and updates to our teaching schedule. You may unsubscribe at any time and your contact information will not be shared.